One of the advantages of window gardening is its simplicity – it is open to every one and impossible to none, by Henry T. Williams. 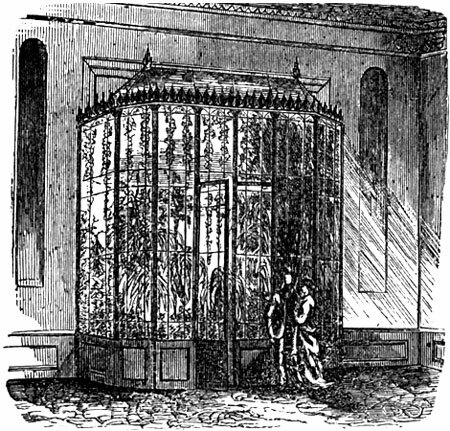 No Victorian home of taste was considered complete without its Window Garden. Indeed it may be said that window gardening is one of the most elegant, satisfactory, yet least expensive of all rural gardening. As a useful means for developing a taste for plant life and a love for flowers, nothing is as charming as this simple style of gardening placed in old house windows. One of the advantages of window gardening is its simplicity – it is open to every one and impossible to none. Persons confined to their homes for the greater part of the day can have as wonderful a garden as the available window can afford – the size of the window being the only limitation. To watch the unfolding leaves and budding flowers with the development of branch after branch is exquisitely interesting to the person who plans, tends and then enjoys the indoor garden. Window gardening is a form of gardening of year-round use and value. The window garden is independent to a large degree of the varying seasons, for it can be made attractive every month in the year. The advent of spring, summer and autumn, only render the plants of the window garden more flourishing and make the flowers more brilliant, but they do not die with the first frost or cold wind in winter. When the vista of the flowerless winter landscape looms, we can still look to our fern cases, window boxes, or hanging-baskets because they are so charming in their contrast with the desolateness outside, and are pleasant remembrances of the greener days gone by. 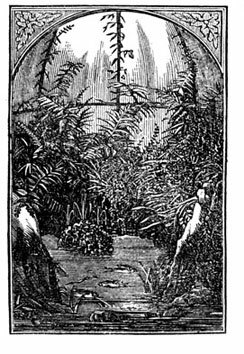 The Victorian window gardener had choice of a great number of designs for the enjoyment of his greenery. There was the window-box of evergreens, ferns, or ornamental plants; the jardinière, the hanging basket, the row of bulb glasses, the plant cabinet, the fernery, the Wardian case, and finally the conservatory. Moreover, there were flower stands, étagère and mantel piece gardens. 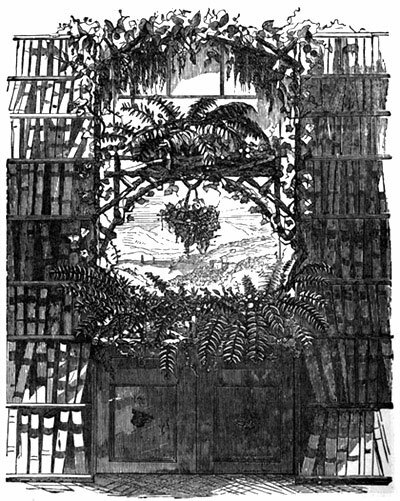 The above image is a sketch of a library window, about 3 feet wide and 6 feet high, with book shelves on either side and a closet below for magazines. The window sill is made of extra width, say 14 inches. Here is placed a simple waterproof tray of about 3 inches in depth, made to fit the sill exactly. The tray is filled with topsoil, and then the plants are arrange inside. At each end is an English Ivy, and the spaces between are filled with hardy ferns, which usually remain green down to the coldest winds and frosts of autumn. About midway up the window is thrown across a miniature rustic bridge, upon which is still another but narrower tray, with lighter and more delicate ferns, such as maiden's hair. This rustic bridge may be decorated with a lattice of the bright red dogwood, mingled with the white shoots of the linden. On the top of the window, as a cornice, some rustic branch from a tree, may be selected, twisted and crooked; yet affording numerous brackets for climbing plants to rest upon. Upon this moss-covered bark the ivy of the lower box is expected soon to grow up to and crawl over, throwing its tendrils right and left, and filling it full with green foliage. A little hanging basket from the rustic archway, fills out the uniqueness of the picture. In finer homes, where window gardens are dressed in highest elegance, there is a very popular form of window garden consisting of a glass case, projecting beyond the window sashes, somewhat like a little glass bay window. These are made in every style, with rustic work in front, or of an architectural character to harmonize with the style of the building as shown in the images below. In the winter, the glass gardens are charmingly arrayed with ferns, evergreens and flowering plants; while in the spring time these give place to Roses, Fuchsias, Pelargoniums, and a variety of other plants suitable for the season. They are exceedingly simple, and in addition to providing a beautiful garden to the occupants of the house they are a great addition to the exterior ornaments of the building. The best plants for these window cases are ferns, which require little attention, and the grower will also observe not to place them in a southern window; a northern or western one will be much better for they need little or no heat. As these window cases cannot be heated, no plants should be placed in there which require artificial warmth. 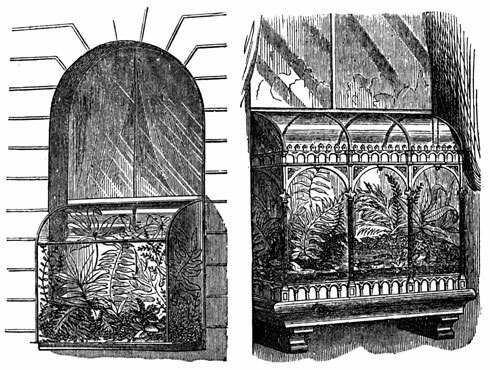 The image to the left features a combined window case aquarium and fernery. This occupies the window from the sill to top of the upper sash. The tank within occupies one-third of the whole window on the outside of the case, the inner side nearest the room being of glass to afford a view of the interior. The window completely shuts out the street view and is lighted only from the top. Specimens of rock work are introduced at the sides or in the rear of the case; on their top are placed some pots containing ferns drooping over and covering the empty places. If desired, a little fountain can be featured, constantly throwing up its tiny streams of water. For planting in such cases, the best plants will be the common English Ivy, which thrives in confined places and rapidly throws up its green foliage. The Lygodium scandens and Lygodium japonica are lovely climbing ferns. Trichomanes radicans, Hymenophyllum Tunbridgense, Asplenium fontanum are moisture lovers and generally used in furnishing tanks for the aquarium. As for the aquarium, small varieties such as the gold carp are most suitable, and for every two gallon capacity of the water tank, put in one carp. Of water plants the best is Vallisneria spiralis, which will grow among pebbles if left undisturbed. Confervae may be introduced and allowed to run over the rock or sides of the aquarium. One of the problems every window gardener has to solve is, to allow his plants all the needed light, air and warmth, and yet protect them on the one hand from either the dry heat of the living room, and on the other side from penetrating draughts of cold air. 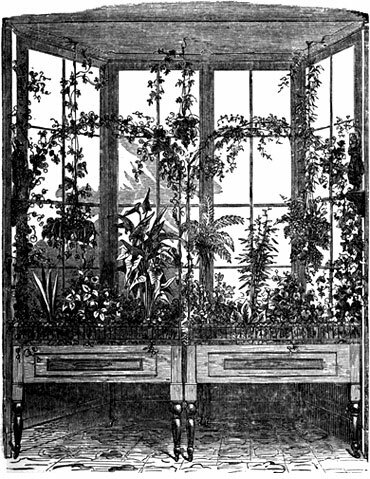 This has been solved by the building of plant cabinets resembling an indoor greenhouse as shown above. This structure occupies not only the whole recess of the window, but are built out somewhat into the room, and the entire interior enclosed with glass sides or doors as a partition from the room. The above design features a glass case constructed in front of a window and projecting into the room with a door opening into it so that it can be easily entered. It would be well to build the floor of this “garden house” of wood and a little higher than that of the room so that when necessary it can be removed without injury to the house. The lower portions of the case to the height of about two feet should be of wainscot. Inside the cabinet this paneling is lined with troughs adjacent with each other, and having a slight slope towards another trough lower than all the rest; it should be so contrived that any water draining from the pots or boxes containing the plants may run off into the lower trough which should have no flower pots in it. Climbing plants are placed in these troughs, alternately with Orange Trees, Camellias or flowering shrubs, so that they can be seen from the room. It is supposed, also, that the outside window is a bow-window or at any rate projects beyond the sides of the house. This design may be on too large a scale for ordinary purposes, but it serves to illustrate the idea that plants always thrive best when placed in rooms entirely by themselves. In such a cabinet a most glorious opportunity is afforded for decorating the sides of the interior with climbing vines, the ivy, convolvulus, or any other with showy colored flowers. The above window garden features a bow window filled with two boxes supported by legs, each box ten inches deep and filled inside either with earth or separate pots, the interspaces being filled in with moss or earth. The aim is to give a chance to plants with fine contrasts of foliage -- Pelargoniums, Petunias, Heliotropes, Fuchsias, Amaranth, Coleus, Begonia, Geraniums, etc. In one end is a Maurandia climbing vine, in the other is a Mexican Coboea, both twining and drooping over the wires which rise from the center of the box and curve towards the sides affording a delicate drapery of green. A hanging basket of moss hangs over each box, the one filled with Oxalis and Tradescantia, the other with Ice Plant. In the vase hanging just over the middle is placed a Kenilworth or Coliseum Ivy. On various brackets below are placed dishes of Ivy, Ferns and Moneywort. A few tall plants may be introduced to advantage, say one large pot full in the centre of each box. In one pot Caladiums, in the other Calla Lilies. Belgian Window Gardens are built outside the window altogether. 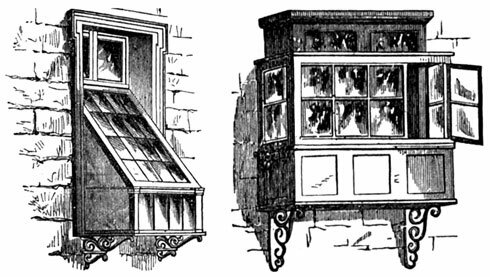 A slab runs out directly from the window sill supported by brackets, and upon this is put a miniature greenhouse, constructed of a glass roof and wooden sides like the above designs. The brackets below are generally very ornamental. Two or three shelves are placed inside on a row next to the window well-supported and covered with pots. Care is taken not to let the case go too high to obstruct the light from entering the room. The plants are watered and arranged from the rooms within, as the windows do not slide up and down, but open inwardly on hinges. 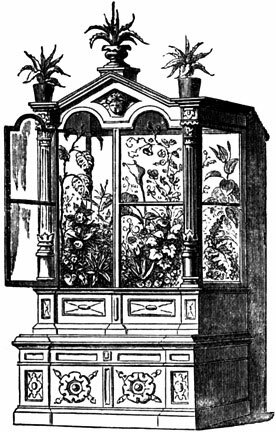 More elaborate window gardens can be placed in a "plant cabinet." This furniture type structure is made with its back entirely open, and then it is pushed up close to the window, fitting it snugly. It is elaborately decorated to coordinate with the style of the other furniture in the room. The door opens into the room, and the tops are ornamented with pots of Cacti and Agaves. The cabinet above features a handsome design for a plant cabinet. The interior is filled principally with plants of stately growth -- Coleus, Calla Lily, Canna, Maranta, Dracaena, Dieffenbachia, etc. An old china cabinet can be transformed into a plant cabinet with little effort. For cottage style decor, it can be painted white and ornamented with floral cabinet knobs. One of the advantages of indoor gardening is its simplicity ... anyone can do it with a little help. From a terrarium to a window garden to a elaborate greenhouse ... learn how to create your own indoor garden.